Being a blogger user nowadays every one want to keep neat & clean blog/website designing interface. 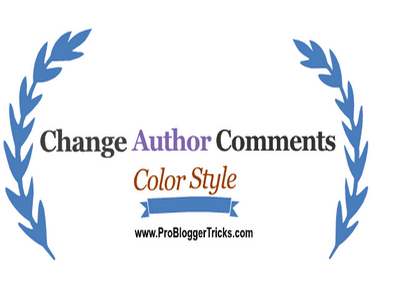 Our Today tutorial will be How to change author comments background color text style in blogger blog. So we were talking about the designing. Blogger platform gives us the opportunity to customize each & every parts of a templates by using any programming languages thats why blogger is first class then wordpress. 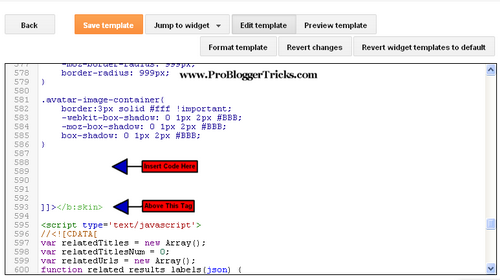 We can full customize blogger templates by inserting Css, java-script, jquery and php inside the templates. 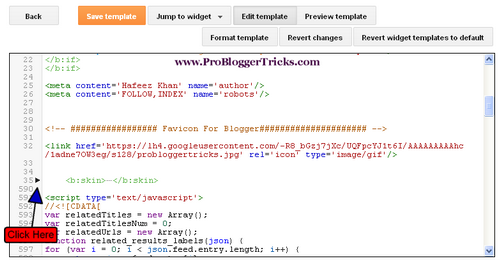 So every blogger user have full rights to customize each sections inside blogger templates. 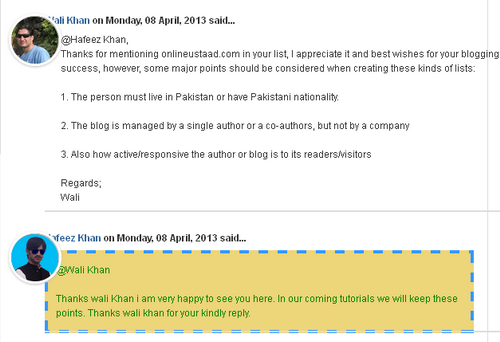 So today we are going to learn how to customize author comments text highlighting different from visitors comments. Why to Change The Author Comments Text Color Styles In Blogger ? 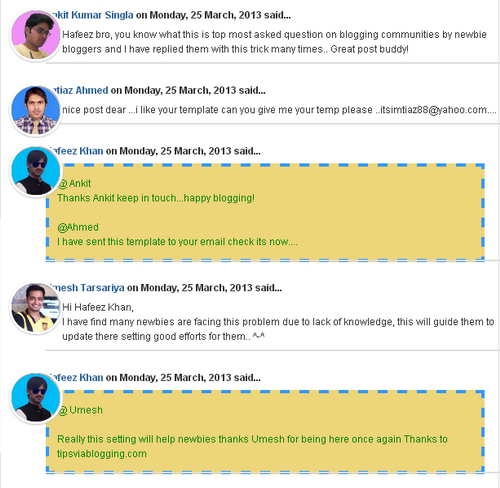 There are numerous benefits if using unique comments box for Blog Author. let clear it Sometime you might be get hardy to find your answer from Pro Blogger blog if you left a comments on theirs blogs for any query and when after sometime you goes back landed there you will face a difficulty to find your answer because they are all the same style for visitors & for Authors, many Pro Bloggers are still using default author comments style. I would strongly recommended you if you are using the same then stop it and doing somethings unique. By using the unique and differ comments texts backgrounds color for Author visitors will take interest in discussions and having dozens of comments we have. How to Highlight and customize authors comments ? You can give different style to yours author backgrounds and Text by playing with the Css codes. 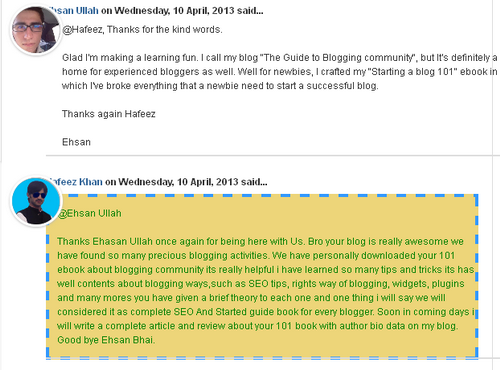 Alert to Blogger: We can change different styles of authors comments area by doing some changing in the above coddings. you can also remove the dashed tag and using wihout it if you dont want to have a dashing borders. Now you have your own choice. Make it for your self which one you like you can give thousands of styles by using this simple css codes. Thanks & happy blogging! Ya Ankit you are right we should must describe our post with images because with the inventions of blogger new Html Editor interface many newbies are in troubles. So everythings should be clear in advance. Thanks to see you. Thanks Bro for your hard appreciations. You always encourage me thankx for the nice moments here with PBT. Hi Hafeez! Great post to share! But I don't have the "" code in my HTML because I use a different template. I can't figure out what code it is that needs to be replaced :( Any tips? 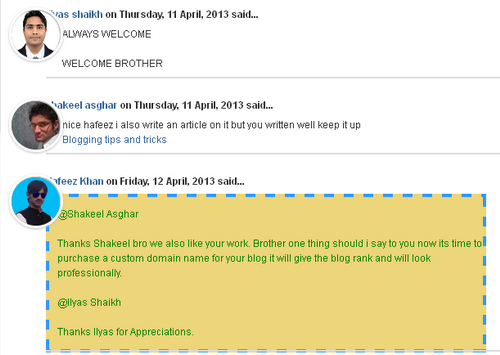 HI Hafeez, i had a problem I can't see comments in my blog. But it's showing the count of comments. I Don,t Know whats you means Hafeez Khan Comments Should be dofollow and from highly PR websites but in all your posts you did not concentrate on highly PR websites or Dofollow comments even in your this websites comments are nofollow I think so you need plug-in Dofollow from firefox am i right ? ?